Did winter storms leave your property with some ugly stumps? Get rid of those stumps quickly by calling StumpTech. 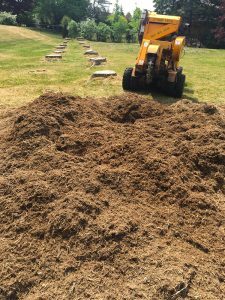 We have more than 5 years of experience removing stumps and more than 8 years of experience in the tree industry. Our technicians have the training and experience to get rid of even deep and stubborn stumps quickly and without damaging your property. All of our techs have the best professional grade stump grinders and equipment to tackle any size stump. They can also work on any size property, even a small lawn or yard. Fenced yards are not a problem either. Our staff members just need to have an opening in the fence that is at least 36” wide so they can get the equipment inside. There is no property we can’t work on. If you have one stump to get rid of or many stumps to get rid of our talented techs can take care of it. Even if you have a large property full of stumps they can get the job done safely and quickly. StumpTech does have a minimum rate of $150 (+HST) for any work that is done. This is not an add on fee, this fee covers a certain amount of work. For example, if you have three small stumps that are easy to reach with our equipment all three stumps can be removed for one minimum charge. Most homeowners don’t end up paying more than the minimum fee. 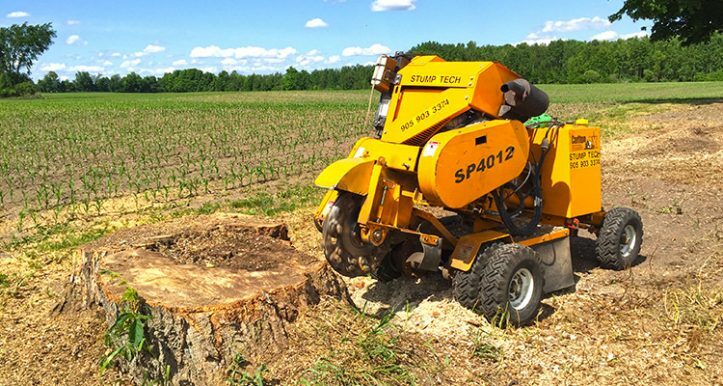 Why Hire A Professional Scugog Stump Removal Company? 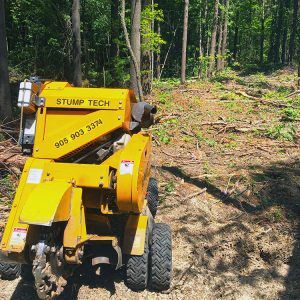 It just makes sense for homeowners to call professionals like StumpTech to get stumps removed from their property. Some jobs around the house you can fudge on and do yourself to save a little money. But stump removal isn’t a job that you should be cutting corners on. Stump removal isn’t easy, and for people that don’t know what they’re doing it can be dangerous. Removing stumps without the right equipment can end up causing serious injuries for inexperienced people. And if you don’t know how deep down the stump roots go you might end up not even removing all of the stump which can cause problems later on. You could cause instability in the area around the stump. Professionals who come in with skills and experience as well as the right professional grade equipment can get rid of stumps in no time. But if you try to DIY the stump removal it could take you days or even weeks of trying to get the stump out. You could spend a lot of money, waste a lot of time, and possibly get hurt. So when it comes to getting rid of stumps do the smart thing and call the professionals.